Two-tone Tote bags, featuring the classic Orpheus Music Lizard logo. 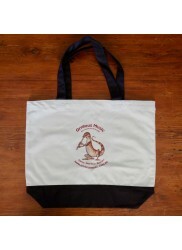 Orpheus Music Lizard Tote Bag - great for everyday use, but also makes a perfect gift. Dimensions are 47cm (W) x 38cm (H), 100% cotton.